Pater studied with the great eighteenth-century master Jean-Antoine Watteau, from whose work he often borrowed. 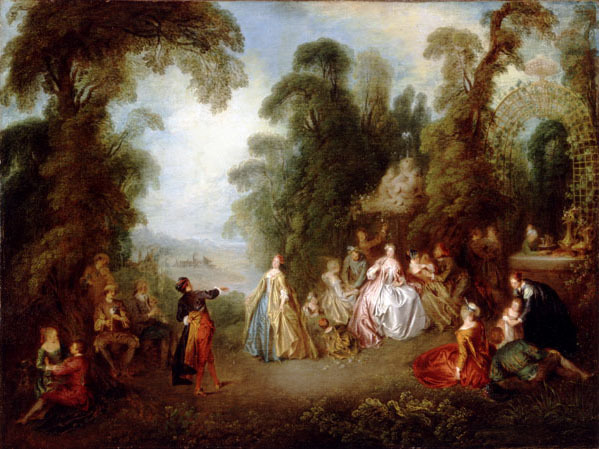 Like Watteau, he favored the theme known as fête galante, a romantic grouping of elegant figures within a dreamlike landscape. These paintings reflect a shift in French art from the grand and stately Baroque manner of the seventeenth century to the more intimate and refined style of the early eighteenth century known as Rococo. By this time painting was no longer primarily a court art but an art of society, and the interaction between men and women was often treated in a lighthearted manner, as in The Dance. As the number of paintings commissioned by private patrons increased during the Rococo period, many artists repeated the same theme. Pater, despite this repetition, always maintained a sensitive handling of delicate colors and a penchant for careful detail, especially in the figures.